Heirloom seeds are the most sought-after seeds for an organic gardener. The definition of a heirloom seed/plant is the one which keeps its traits via open pollination. In today's business making world, heirloom seeds/plants are getting rarer. 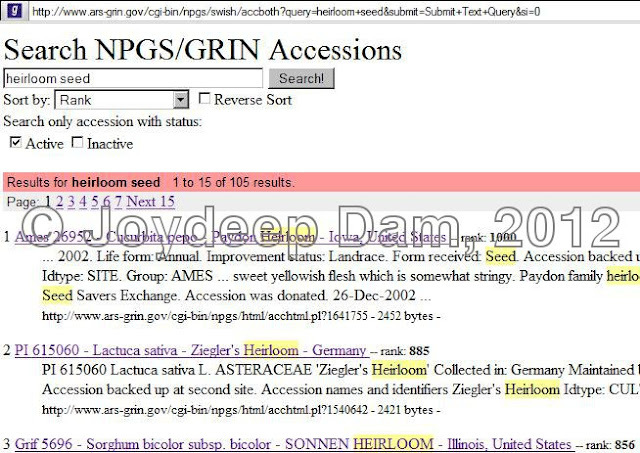 There are some well reputed organizations/companies still sell heirloom seeds, for example, http://seedsavers.org/. Do not use the seeds for commercial purpose. People from outside USA, keep in mind that heirloom bean seeds are NOT possible to send, due to fact that the department has to pay quite some money to custom declarations. Inside USA, you can ask for them though. Once you are on that page, type "heirloom seeds" in the search box. Below is a screenshot. (1) is showing the web address and (2) is showing where to do seed search. The list will be shown in another page as below. Make sure you select only seeds with "Active" status. Click on one of the results and a new page will be opened describing the plant, seed, source history etc. You need to click on "Request this germplasm" link on this page under the section "Availability". You will be forwarded to a page where your request list (1) will be shown as below. Check once again that everything is ok and press "Complete" (2) to go to next step. This step will take you to the page where you need to fill in a form. Fields with (*) are mandatory. If you plan to grow and test the seeds in small scale vegetable garden of yours, write that into "Describe your planned research use of this NPGS Germplasm" field. Once done with filling the form, press "Submit Order" button. If you like you can select the option to have carbon copy of the form you sent into your email address. Finally wait for the arrival of the seeds. And lastly, if they are not able to send you the desired seeds, they will inform you with a letter, describing the cause of that. But if you receive what you were looking after, start them growing and save seed from your harvest. In that way you can produce year after year the same crop without changing genetic variation. Please share your experience/knowledge about where to collect heirloom seed and their growing. Feel free to put comment at the bottom. We've got heirloom seeds and heirloom seed kits. Thanks for the post. I had no idea the government would give them away. Sounds great! Happy gardening. Like this one, in many countries, there are many government seed banks for various purposes and most of them usually give away certain amount of seeds free.